Neuroimaging or brain imaging is the use of various techniques to either directly or indirectly image the structure, function, or pharmacology of the nervous system. It is a relatively new discipline within medicine, neuroscience, and psychology. 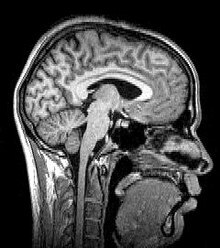 Physicians who specialize in the performance and interpretation of neuroimaging in the clinical setting are neuroradiologists. The first chapter of the history of neuroimaging traces back to the Italian neuroscientist Angelo Mosso who invented the 'human circulation balance', which could non-invasively measure the redistribution of blood during emotional and intellectual activity. However, although briefly mentioned by William James in 1890, the details and precise workings of this balance and the experiments Mosso performed with it have remained largely unknown until the recent discovery of the original instrument as well as Mosso’s reports by Stefano Sandrone and colleagues. Sagittal MRI slice at the midline. Axial MRI slice at the level of the basal ganglia, showing fMRI BOLD signal changes overlaid in red (increase) and blue (decrease) tones. ^ Filler A (12 July 2009). "The History, Development and Impact of Computed Imaging in Neurological Diagnosis and Neurosurgery: CT, MRI, and DTI". Nature Precedings. doi:10.1038/npre.2009.3267.5. ^ Sandrone S, Bacigaluppi M, Galloni MR, Martino G (November 2012). "Angelo Mosso (1846-1910)". Journal of Neurology. 259 (11): 2513–4. doi:10.1007/s00415-012-6632-1. PMID 23010944. ^ Sandrone S, Bacigaluppi M, Galloni MR, Cappa SF, Moro A, Catani M, Filippi M, Monti MM, Perani D, Martino G (February 2014). "Weighing brain activity with the balance: Angelo Mosso's original manuscripts come to light". Brain. 137 (Pt 2): 621–33. doi:10.1093/brain/awt091. PMID 23687118. ^ Miller TH, Kruse JE (October 2005). "Evaluation of syncope". American Family Physician. 72 (8): 1492–500. PMID 16273816. Moya A, Sutton R, Ammirati F, Blanc JJ, Brignole M, Dahm JB, Deharo JC, Gajek J, Gjesdal K, Krahn A, Massin M, Pepi M, Pezawas T, Ruiz Granell R, Sarasin F, Ungar A, van Dijk JG, Walma EP, Wieling W (November 2009). "Guidelines for the diagnosis and management of syncope (version 2009)". European Heart Journal. 30 (21): 2631–71. doi:10.1093/eurheartj/ehp298. PMC 3295536. PMID 19713422. "Neuroimaging for the evaluation of chronic headaches: an evidence-based analysis". Ontario Health Technology Assessment Series. 10 (26): 1–57. 2010. PMC 3377587. PMID 23074404. ^ Thomas DG, Anderson RE, du Boulay GH (January 1984). "CT-guided stereotactic neurosurgery: experience in 24 cases with a new stereotactic system". Journal of Neurology, Neurosurgery, and Psychiatry. 47 (1): 9–16. doi:10.1136/jnnp.47.1.9. PMC 1027634. PMID 6363629. ^ Levivier M, Massager N, Wikler D, Lorenzoni J, Ruiz S, Devriendt D, David P, Desmedt F, Simon S, Van Houtte P, Brotchi J, Goldman S (July 2004). "Use of stereotactic PET images in dosimetry planning of radiosurgery for brain tumors: clinical experience and proposed classification". Journal of Nuclear Medicine. 45 (7): 1146–54. PMID 15235060. ^ Jeeves MA (1994). Mind Fields: Reflections on the Science of Mind and Brain. Grand Rapids, MI: Baker Books. p. 21. ^ Eggebrecht AT, White BR, Ferradal SL, Chen C, Zhan Y, Snyder AZ, Dehghani H, Culver JP (July 2012). "A quantitative spatial comparison of high-density diffuse optical tomography and fMRI cortical mapping". NeuroImage. 61 (4): 1120–8. doi:10.1016/j.neuroimage.2012.01.124. PMC 3581336. PMID 22330315. ^ Eggebrecht AT, Ferradal SL, Robichaux-Viehoever A, Hassanpour MS, Dehghani H, Snyder AZ, Hershey T, Culver JP (June 2014). "Mapping distributed brain function and networks with diffuse optical tomography". Nature Photonics. 8 (6): 448–454. doi:10.1038/nphoton.2014.107. PMC 4114252. PMID 25083161. ^ Smith K (March 5, 2008). "Mind-reading with a brain scan". Nature News. Nature Publishing Group. Retrieved 2008-03-05. ^ Keim B (March 5, 2008). 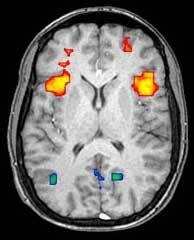 "Brain Scanner Can Tell What You're Looking At". Wired News. CondéNet. Retrieved 2015-09-16. ^ Boto, Elena; Holmes, Niall; Leggett, James; Roberts, Gillian; Shah, Vishal; Meyer, Sofie S.; Muñoz, Leonardo Duque; Mullinger, Karen J.; Tierney, Tim M. (March 2018). "Moving magnetoencephalography towards real-world applications with a wearable system". Nature. 555 (7698): 657–661. doi:10.1038/nature26147. ISSN 1476-4687. PMC 6063354. PMID 29562238. ^ Wolters CH, Anwander A, Tricoche X, Weinstein D, Koch MA, MacLeod RS (April 2006). "Influence of tissue conductivity anisotropy on EEG/MEG field and return current computation in a realistic head model: a simulation and visualization study using high-resolution finite element modeling". NeuroImage. 30 (3): 813–26. doi:10.1016/j.neuroimage.2005.10.014. hdl:11858/00-001M-0000-0019-1079-8. PMID 16364662. ^ Ramon C, Haueisen J, Schimpf PH (October 2006). "Influence of head models on neuromagnetic fields and inverse source localizations". Biomedical Engineering Online. 5 (1): 55. doi:10.1186/1475-925X-5-55. PMC 1629018. PMID 17059601. ^ a b Nilsson L, Markowitsch HJ (1999). Cognitive Neuroscience of Memory. Seattle: Hogrefe & Huber Publishers. ^ "SPECT Systems for Brain Imaging". Retrieved July 24, 2014. ^ "SPECT Brain Imaging". Retrieved January 12, 2016. ^ a b c d Crosson B, Ford A, McGregor KM, Meinzer M, Cheshkov S, Li X, Walker-Batson D, Briggs RW (2010). "Functional imaging and related techniques: an introduction for rehabilitation researchers". Journal of Rehabilitation Research and Development. 47 (2): vii–xxxiv. PMC 3225087. PMID 20593321. ^ Tsai LL, Grant AK, Mortele KJ, Kung JW, Smith MP (October 2015). "A Practical Guide to MR Imaging Safety: What Radiologists Need to Know". Radiographics. 35 (6): 1722–37. doi:10.1148/rg.2015150108. PMID 26466181. ^ Center for Devices and Radiological Health. "MRI (Magnetic Resonance Imaging) - MRI Safety Posters". www.fda.gov. Retrieved 2018-04-10. ^ a b Brenner DJ, Hall EJ (November 2007). "Computed tomography--an increasing source of radiation exposure". The New England Journal of Medicine. 357 (22): 2277–84. doi:10.1056/NEJMra072149. PMID 18046031. ^ Smith-Bindman R (July 2010). "Is computed tomography safe?". The New England Journal of Medicine. 363 (1): 1–4. doi:10.1056/NEJMp1002530. PMID 20573919. ^ "What happens during a PET scan?". PubMed Health. 2016-12-30. ^ Satel S, Lilienfeld SO (2015). Brainwashed: The Seductive Appeal of Mindless Neuroscience. Basic Books. ISBN 978-0465062911.